French President Nicolas Sarkozy has warned the international community must not let Afghanistan fall into the hands of extremists like the Taleban. He was speaking on a one-day visit to Kabul where he met his counterpart, Hamid Karzai, and was due to see some of the 1,300 French troops based there. 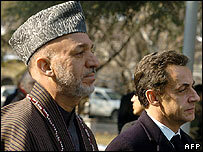 Mr Sarkozy recently pledged France's support for the US in Afghanistan. His office said the visit to Kabul was a reaffirmation of French support and engagement in Afghanistan's recovery. Accompanied by his defence minister, he began the one-day trip with talks with the head of the Nato-led International Security Assistance Force, Gen Dan McNeill. "Here there is a war against terrorism, against fanaticism, that we cannot and must not lose," Mr Sarkozy told reporters after his talks with Mr Karzai. "That is why it is important that we help with the emergence of an Afghan state that is legitimate, democratic and modern." Mr Sarkozy told the US Congress in November that French soldiers would stay in Afghanistan "as long as needed" and that failure was "not an option". However, Washington and other allies have repeatedly urged France to send its forces to the more dangerous southern and eastern areas to help in the fight against a resurgent Taleban. Most of the French troops are stationed in relatively secure areas around Kabul. 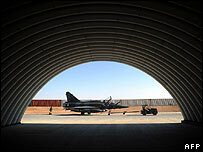 Some are deployed at a base in the southern city of Kandahar, where six French Mirage jets are based. In addition, "dozens" of French military trainers are due to be posted to the volatile southern province of Uruzgan to work with the Afghan army, the French news agency AFP notes. Accompanying Mr Sarkozy on the visit are French Defence Minister Herve Morin and Foreign Minister Bernard Kouchner.